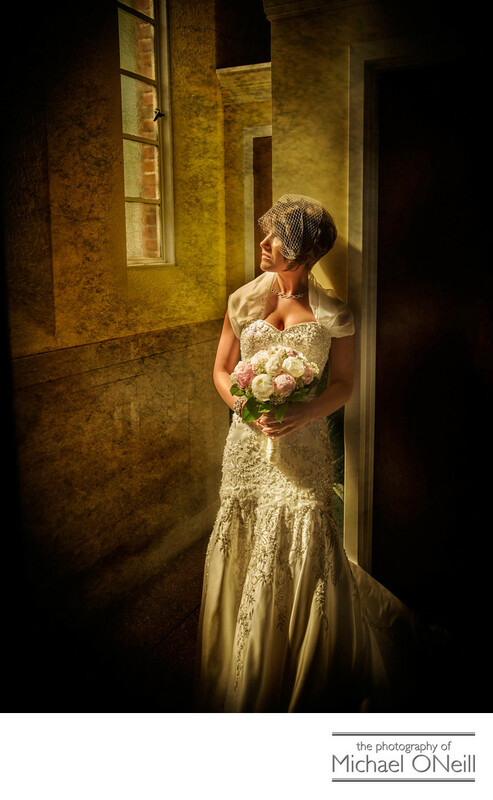 This photograph was taken just as the bride arrived at church for the wedding ceremony. In just a few short minutes she would be walking up the aisle with her father and the groom would be seeing her in her wedding gown for the first time. The reveal, as it is sometimes called, is a very special moment at every wedding; and capturing the look on the groom’s face when he sees his bride for the first time is one of the most important photographs your wedding photographer takes. When the bride arrived at church I brought her over into this small room that is located at the back of St. Joseph RC Church in Kings Park, New York. The afternoon sun was streaming through a yellow stained glass window casting a beautiful light into the room. I positioned the bride carefully in this stream of light and captured this wonderful image of the private time she had just before getting married. Saint Joseph’s Roman Catholic Church in Kings Park, NY is a beautiful venue for a wedding ceremony or mass. High ceilings and deep rich wood is accented beautifully by the natural light that streams in through large stained glass windows that run the length of both sides of the church. After the intimate wedding ceremony we left church with the bridal party to have a photo session at the castle-like Vanderbilt Museum in Centerport, New York. The magnificent mansion with it’s cobblestone courtyard is an ideal spot to create wonderful wedding images. Beyond the courtyard the boxwood gardens and great lawn overlook Northport Bay and beyond to the Long Island Sound. When this bride and groom returned from their honeymoon we did one of my creative couture post wedding second day photography sessions; starting in the full camera room of my East Northport, NY studio and gallery and then traveling to a quiet spot in a forest, and finally up to the jetty on the Town of Huntington beach at Crab Meadow in Northport for some breathtaking sunset shots. A few more of this bride and groom’s wedding pictures are on this web site for you to enjoy. Give me a call and we’ll talk about the plans for your big day, and perhaps even a pre-wedding or post-wedding couture session where we can be as creative and adventurous as you wish.